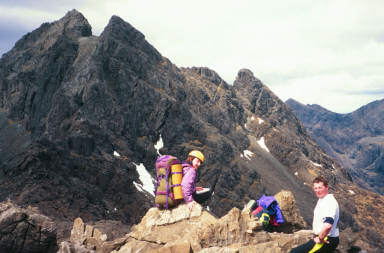 Second attempt at the Cuillin Ridge the first year being frustrated by continual rain.Resulting in several hours tramping towards Loch Coruisk,where we camped.The next day showed no improvement in the weather so we walked down to the loch.On our return could we see that little green tent perched on the mountain side,could we heckers like.Feeling utter prats we spent ages looking for it.A lesson for anyone not to leave your tent without marking it. This second attempt was much better,unfortunately i started comming out in a rash(sounds dodgy) and it was down to the docs and then the pub. So its on with attempt no.3 Simon is a deceptively slim 15 stone rugby player,who likes overtaking on single track roads,and trying to miss car ferries.He has an enormous 8 season sleeping bag which he carries everywhere packed with an Egon Ronnay cuillin kitchen pack,needless to say he can survive anything.